In a whirlwind of activity last night, I completed the dining room chair seat covers in a decorative mossy green and blue fabric. My parents arrive tomorrow and it was one of my last sewing tasks to be completed. Now I can focus on grocery shopping and the menu for the week ahead! 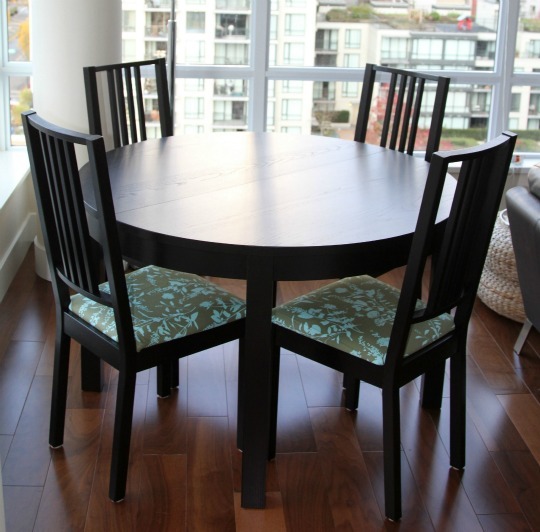 We recently purchased this small dining room table from IKEA, as we needed something compact. Although the store can be hit or miss in quality, it generally offers functional furniture that fits my nomadic lifestyle. I picked out the round table shown above but wasn’t thrilled about the chair options. I liked the Borje chair style but the chairs came with nasty, cheap white fabric cushion covers. Fortunately, the cushion covers were removable so we bought the chairs with the plan that I would sew new seat covers. and fabric, and a little creativity. My only concern with the chairs was on which fabric to use. A couple years ago I bought a surplus of Joel Dewberry Ginseng Wildflowers in the sage color when it went on sale at Fabric.com. Not only did I order more than I needed, the company mistakenly sent me a couple extra yards! I love the fabric but wasn’t sure if it was the pattern or color I wanted in the living space. Since I haven’t had time to shop for anything better, it became the lead choice by default. If I were upholstering the cushion in fabric, I would lay the cushion on the fabric and cut around it, allowing enough excess fabric to compensate for the cushion thickness. 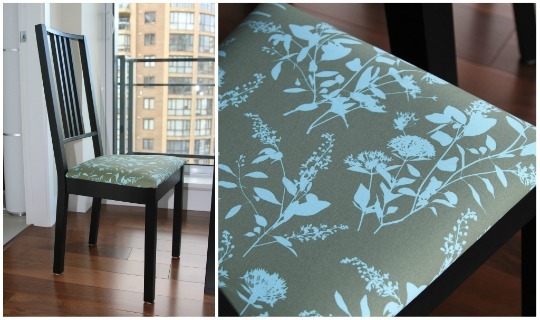 I would then use a staple gun to attach the fabric around the cushion with staples placed on the underside. I could have done the staple approach but liked the idea of removable cushion covers. I’m a spiller so being able to remove the seat covers and wash them will be a benefit. 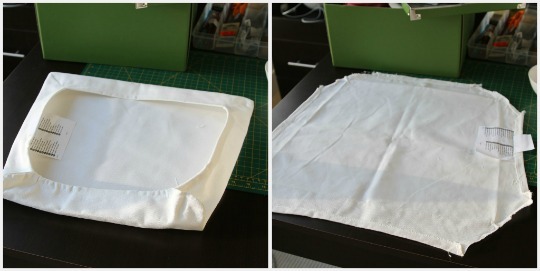 Since I already had a seat cover in hand, I cut apart the main seams so I could use it as my cushion cover pattern. I put it on my fabric and marked around it before cutting the fabric to size. It’s important to make sure you don’t rush. I like to rush. Make sure that you align the pattern the same way on your fabric for each cushion you cut out. I have one chair on which the fabric pattern runs in the opposite direction. It’s not a big deal, but I notice it and it annoys me. Also, I found it helpful to take photos of the existing cushion cover before and after I cut it apart. You may think that you’ll remember what it looked like, but once you cut it apart there’s no going back. I quickly forgot how the corners folded and ended up taking off another cushion to see how it had been constructed. Overall, it only took me about an hour to whip these out last night. The fabric color is growing on me but is making me reconsider our couch cushions. For now, I’m going to enjoy the upcoming holiday and worry about that some other time.